A beautiful home is made up of the smaller accents. One such way to add beauty to your home is with a meticulously crafted indoor plant stand. Houseplants and flowers can transform any room in the house into a lush and lively oasis. When looking for a way to proudly display your greenery, add to the beauty with a carefully hand-carved indoor plant stand made of stunning mahogany wood. Our collection of plant stands have been made with the finest materials by skilled artisans passionate about antique reproductions. 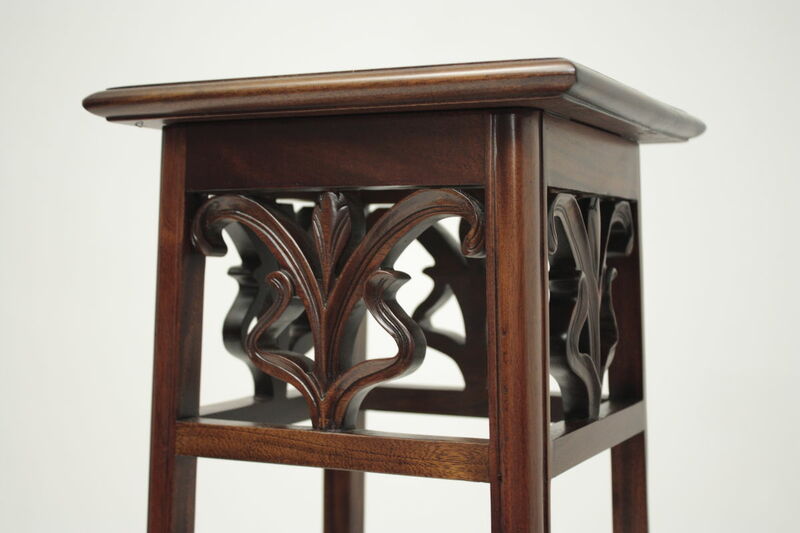 Offered in a variety of sizes and designs, every indoor plant stand we proudly feature is made of solid 100% mahogany wood and displays exquisite details carved by hand. We offer larger plant stands for plant lovers looking to house several plants, as well as smaller tea table sizes for a subtle touch. Choose from many of the most beloved styles of the past, such as Chippendale, Victorian, and Empire, in both round and square options. We offer a variety of semi-gloss satin finishes to choose from to help you find the perfect addition to your existing décor. As with any piece of furniture meant for both aesthetic appeal and functional purpose, each indoor plant stand has been made with stability in mind. The legs are all made of solid mahogany and feature either a three leg design for added support or four legs for evenly distributing weight placement without worry of tipping over. Whether looking for a large three-shelve Victorian display rack featuring exquisitely carved spiraled turned spindles, a Chippendale with handmade charm and displaying intricate carvings, or a small pedestal wine table with a beautifully burnished sheen and stunning finish, every option offered has been lovingly made to perfectly resemble antique furniture full of exceptional beauty and grace. Add a small touch of sophistication to your home today with these thoughtfully crafted plant stands and small tables. At Laurel Crown, our name is synonymous with exceptional workmanship and high-quality durability. Every piece we offer meets the highest standards of excellence for a beautiful addition to your home.